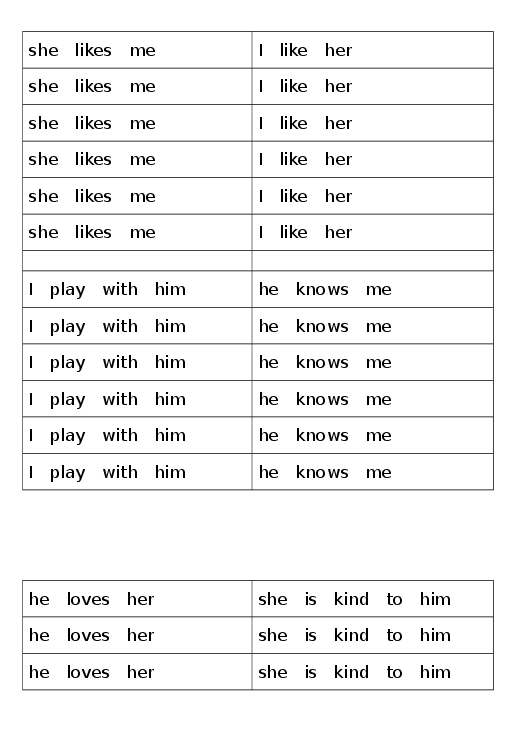 Let's Teach English: Objective Pronouns "He likes her"
Objective Pronouns "He likes her"
Review Objective Pronouns (me, him, her) with a little worksheet, and then some scrambled sentences. 1. Hold up the character cards and have some cursory conversation about them. 2. Put cards on the board and draw a little heart from one or another. E.G. How does he feel about her? "He likes her." Make note of the 3rd person S on the end of likeS. Best done by asking the kids to compare a sentence with it, and one without it. 3. Pattern practice with cards "he likes her," "she likes me," "I like him," etc. Teacher may need to explain grammar a bit if not all kids catch on. before class prep: print up each page on a different color, cut up sentences and put in envelopes. break students into lunch groups and give them an envelope. They must then rearrange the words in the envelope to make a correct sentence, and copy it to their paper. 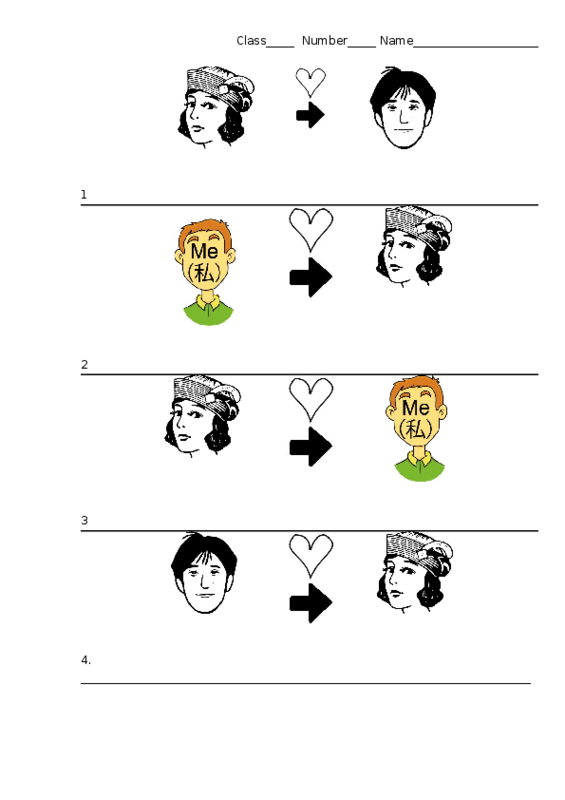 Rather than just doing pattern practice with "likes" you can expand to thinks like "loves," "hates," "helps," "talks with," etc. When doing the scrambled sentence activity, make sure all students write the sentences. If all group members don't copy the sentence, the group will not receive the next envelope. To avoid packing too many envelopes, print on different colored paper and put different colors together into the same envelope. In this activity there were 4 envelopes, each with 3 colors inside. Write lunch group numbers on the envelopes. This helps in case a student comes up after class and says "I forgot to put this word back in the envelope." Instead of going through all the envelopes, you can just ask the student his group number and put it in that envelope.